Majestic Vanguard is a Christian melodic metal band from Sweden. band in Falköping, Sweden. Amongst that bands ranks they also found drummer Daniel Eskilsson. But after recording 2 demos, the band broke up in 1995. The members lost contact, but accidentally run into each other some years later. This first incarnation of the band called themselves Divine Disciples. In 2004 they recorded a demo, and sent it to Rivel Records. They immediately showed interest, and the band singed a contract with them. In light of this deal they decided to include one more member, and guitarist Johan Abelson joined. 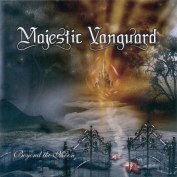 They also changed their name to Majestic Vanguard in 2005. 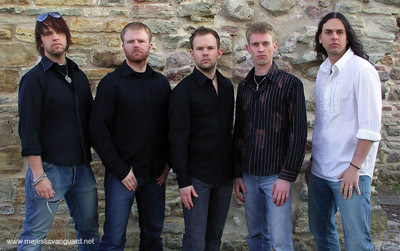 The band has a mix of epic, symphonic and progressive elements in the music, but usually stands under the banner of Power Metal. In 2005 their highly acclaimed debut album “Beyond the Moon” was released. The album was also licensed to labels in Germany & Russia. “The purpose with Majestic Vanguard is to present Jesus Christ to a fallen mankind. Too many voices in our time speak the false prophet’s words. It will all end up in misery. Jesus is the only way to God and through him we can all go free. Majestic Vanguard accepts that fact, and we are Gods respectful servants."